If you’ve made it to the Big Island, or if you’re planning a trip there, it’s highly likely that the main reason for your visit is to check out the Kilauea volcano. 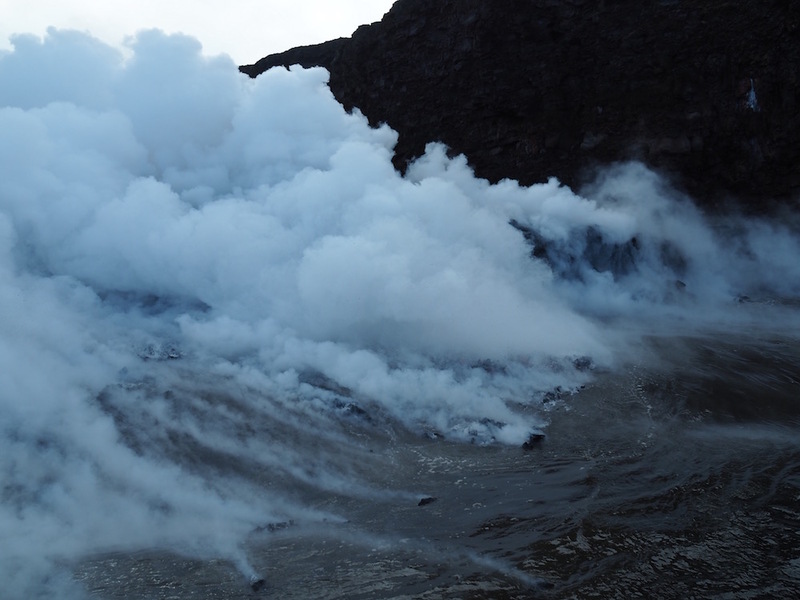 Who wouldn’t put watching lava flowing from an active volcano onto their bucket list? 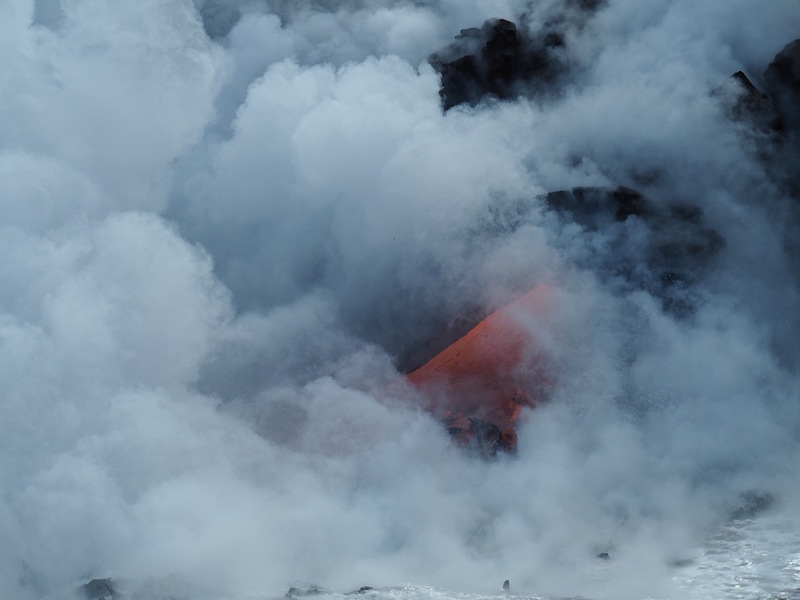 Of course, nature is unpredictable and although the lava is currently flowing, it may not be during your trip. Even if the volcano is churning below the surface it doesn’t mean that you’ll see any. But if you’re in luck and the lava is visible then you should definitely take up the opportunity; it could be the only chance you get in your lifetime. 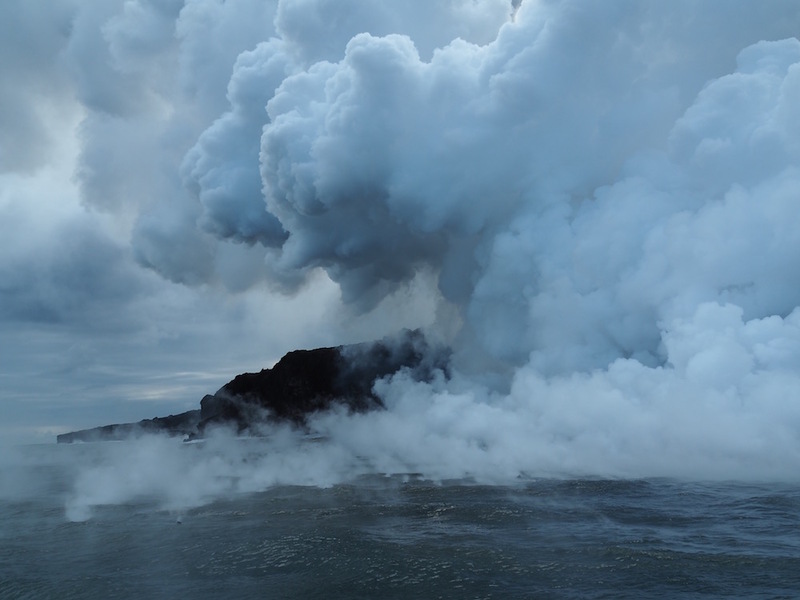 During our recent trip to the Big Island, we were very lucky to visit when Kilauea’s lava was flowing into the ocean. This doesn’t happen every day so we jumped at the chance to head out and see the action up close. 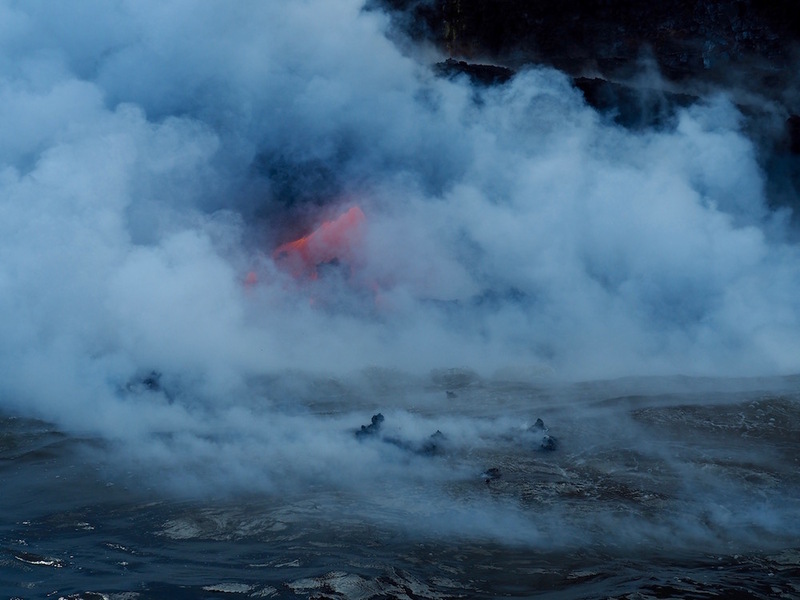 There are a few companies that run boat tours out to see the lava. But after a fair amount of research I discovered that the Hawaii Department of Land and Natural Resources only allows four companies to conduct tours out to the lava; and only some of them are allowed to enter the lava safety zone (closer than three hundred meters to the ocean entry point), that was recently established by the Coast Guard. Lava Ocean Tours are one them*. Their number one ranking on Tripadvisor was another reason why we chose them, and in the end, we were very happy that we did. The tour departs from the Pohoiki Boat Ramp at the Isaac Hale Beach Park. This is a forty-five minute drive South of Hilo, past the Lava Tree State Park. Once you pass the park the road narrows and becomes quite windy. You then drive through a mango tree lined tunnel which makes the journey quite surreal. Our boat was the Lavaone. It was purpose-built for lava watching and is big enough to seat 49 passengers on comfortable, padded benches. All seats offer an 180-degree view of the sea and most are covered and facing forward. It is well designed to give everyone a great view of the action. On our way to the lava! In the parking lot, we climbed up a ladder onto the boat, and the crew backed the boat trailer down a ramp into the water. 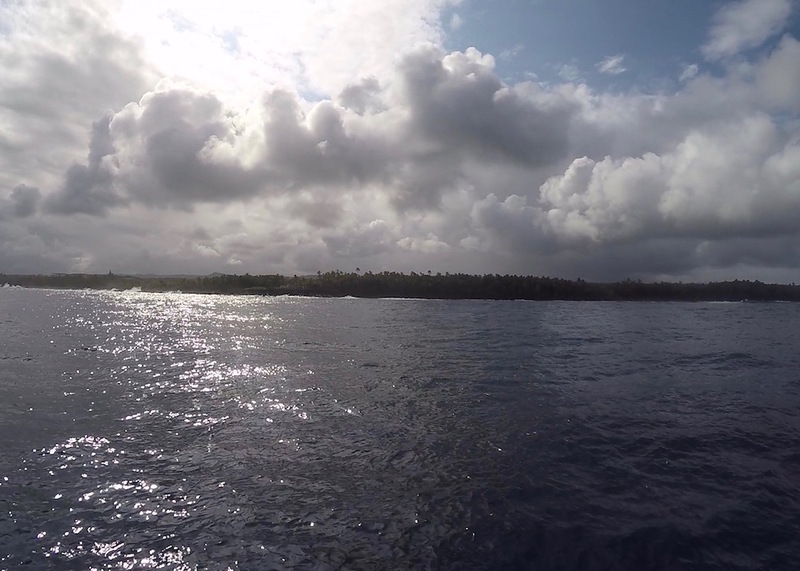 We then headed out of the small harbour and up the coast towards the lava flow. On the way out, we were treated to stunning views of the dark and rugged Kalapana coastline. 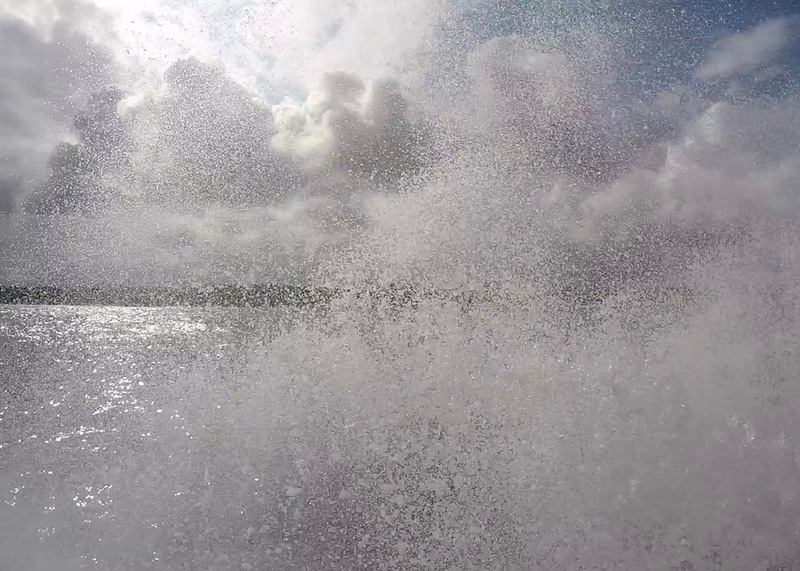 The sea was quite rough and we were sprayed with water a few times as the boat rode the waves. At times it was a bit like being on a roller coaster; it was actually quite a lot of fun! Thank god for the padded seats, and just as well I remembered to take my travel sickness tablets beforehand! On our way to see the lava! 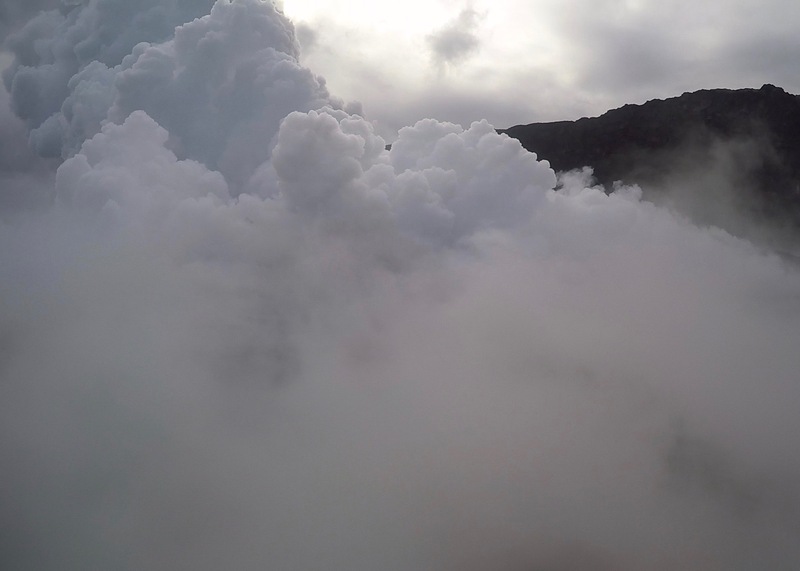 As we neared the lava zone a huge cloud of steam appeared, bellowing out from the sea as the lava hit the ocean and boiled the water beneath it. It was a huge amount of steam! As we were getting closer we could see the cloud of steam. After about forty-five minutes we reached the entry point and our close up lava experience began. We were both in awe of the show that mother nature was putting on for us! Although there weren’t the huge lava hoses we’d seen on Youtube videos, it was still incredible to watch. Through the clouds of steam, we could see the deep, red glow of two small lava hoses. It was amazing. 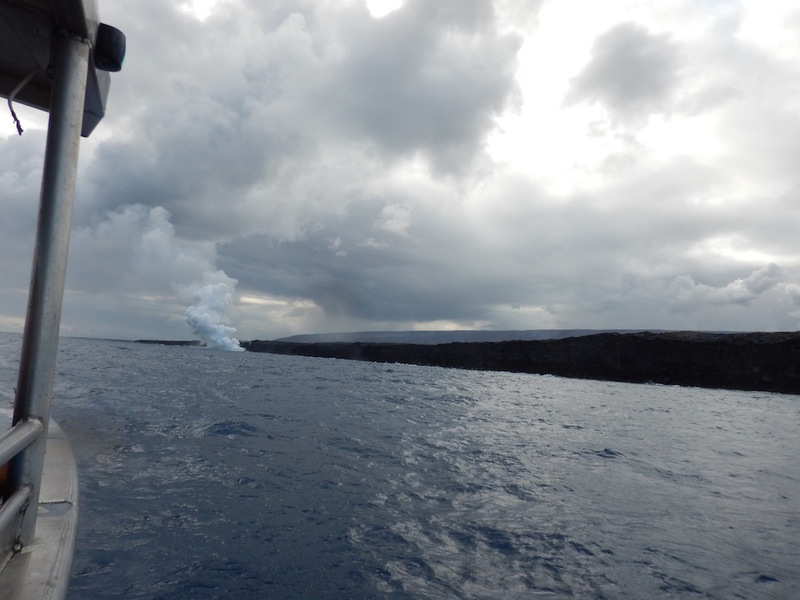 Because the lava was quite tame, the captain was able to take the boat very close to the lava; so much so that we could feel the heat radiating off it. One of the crew even took a bucket of water from the ocean so that we could feel how warm it was. Lava flowing into the ocean. The captain was kind enough to rotate the boat several times so that everyone on board could see the lava and take their photos. It was just spectacular! Check out our Youtube video to see for yourself. Our verdict: Was it worth it? With a $180 or $250 price tag (sunrise and sunset tours cost more) for a two-hour ride, you may think that the tour is too expensive. We can tell you that this trip ranks as one of the most incredible things we have ever done, and we won’t forget it anytime soon. The crew was also very knowledgeable, and at no time during the tour did we feel unsafe. With thirty years of experience, the captain knew exactly what he was doing and we were able to get way closer to the lava than we expected. So yes, it was absolutely worth it; so much so that we’d do it again in a heartbeat. Everyone is just snapping away! 1- Be sure to choose a tour company very carefully. For safety reasons, choose a reputable company that knows exactly what they are doing. 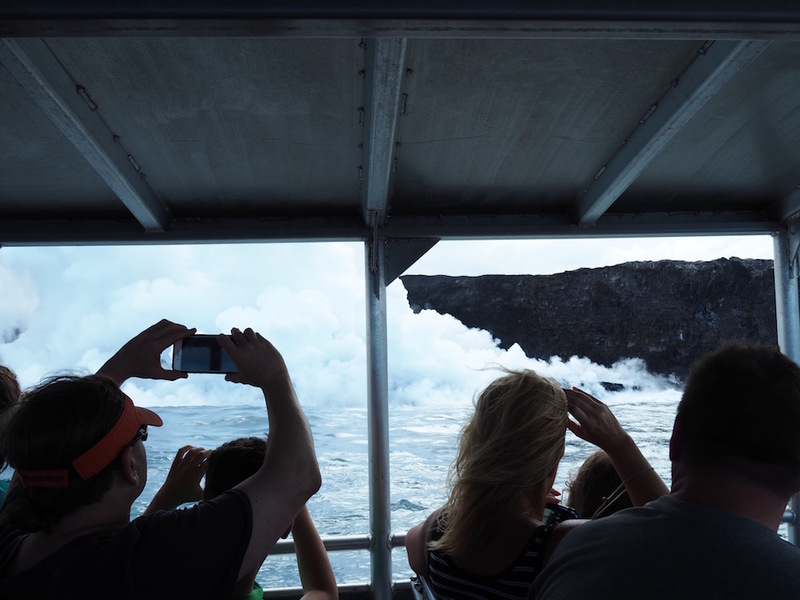 We would definitely recommend Lava Boat Tours; they were excellent. 2- This is an ocean tour. If you are prone to seasickness be sure to take some travel sickness tablets before you leave. You definitely won’t enjoy the show if you’re feeling queasy! 3- If you don’t like getting wet, bring a poncho or a waterproof jacket. The boat is covered on top but if you’re sitting on the sides you’ll probably get some ocean spray in your face. It’s also a good idea to bring a change of clothes with you for after the trip. you still have plenty of space on your memory card. Believe me, you will be snapping off a lot of photos! 5- If your camera is not waterproof, bring a waterproof case or a plastic bag to put it in on the way out and back to avoid it getting salt water damage from the ocean spray. 6- Some people might find this tour quite scary. 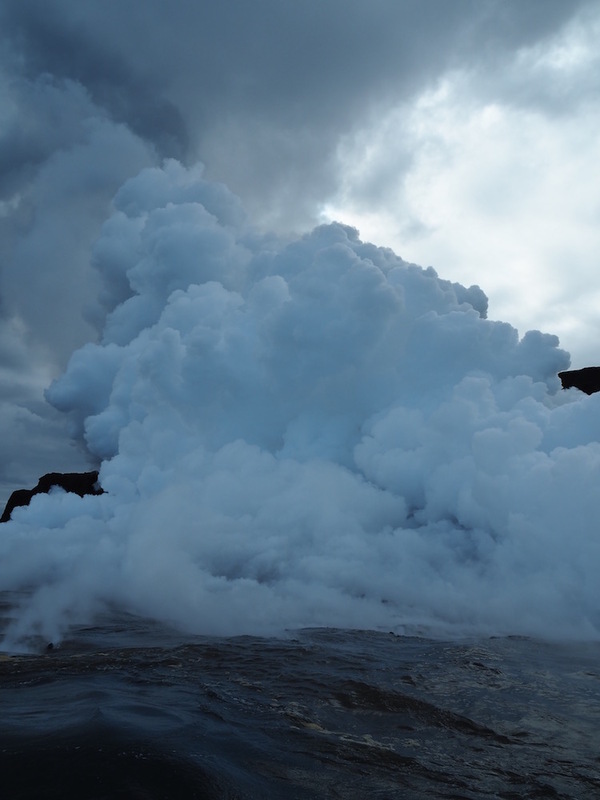 Depending on the weather and lava conditions the boat may get very close to the flow. If you are easily scared, or if you have young children with you, this tour might not be for you. Everyone knows their own limits; some enjoy the adrenaline rush more than others. Personally, I wasn’t even a little bit worried but then again I’m in a trance when I start taking photos. Simon keeps saying that I’ll one day be killed by a bear trying to photograph it instead of running away. He’s probably right! * This new rule was still being reviewed at the time of writing so it may change in the future. Double check the current rules before you book your tour. 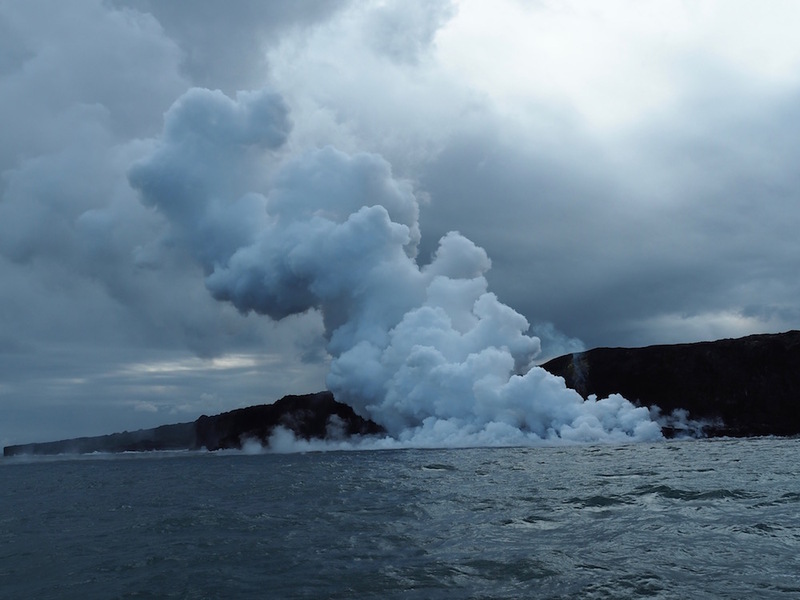 Read about the 10 things to do in Hawaii Volcanoes National Park here. Find out about our favourite things to do on the Big Island here. This looks incredible! Amazing photos- am heading to Oahu soon, wish I’d have time to head over and check this out though! Thanks Katie, I was really incredible for sure. Being so close to the action was awesome. Hope you get to see it next time. Wow…that is so beautiful. Trekked volcanoes but never seen lava up close. Good to know about the tour company as well. Wow, this is incredible! I’ve never heard of this opportunity anywhere else in the world – I don’t think the price tag is too high, especially when this is such a rare experience. 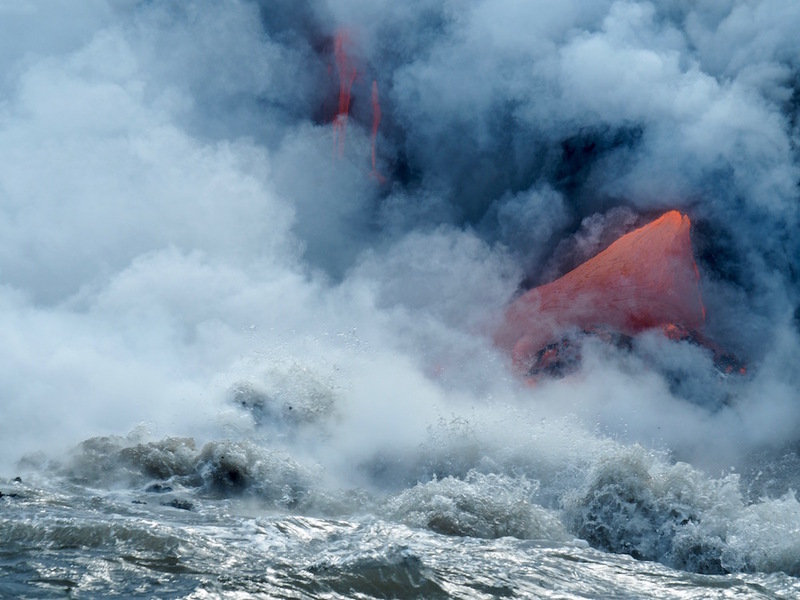 Mother nature is truly incredible, and I would love to see the reaction of lava colliding with the sea. Thanks for the tip on Lava Ocean Tours – they sound great. And for the heads up to take a waterproof camera! Thanks Megan, you are welcome and you are right nature is truly incredible. This is incredible. I didn’t even know such tour exist until I read your post! I’m definitely trying it! Hi Chloe, You should it was amazing. Highly recommended. It’s a once in a lifetime experience. I went on this tour. I payed 250.00 dollars . I am a very healthy and in shape over 50yr old. I was told that I was too old to sit in front and forced to sit in the back of the boat. This happened in front of all the other passengers. I was told that if I didn’t like the rules that I could get off the boat. This was 3:30am in the morning. We had drove over 2 hours to arrive at the location. This was the worst part of my vacation in Hawaii . If I had known this rule ahead of time I would never had payed 250.00 dollars. And instead taken they helicopter ride over the volcano. The management was very rude after I had expressed my concern. Age discrimination to the fullest …. I would not recommend this tour. Take the helicopter ride over the volcano, so much more to see. Hi Wajma, sorry to hear you had such a bad experience on this tour. Thanks for the tips about the helicopter tour. We had one booked but unfortunately it was cancelled for bad weather and we were not able to rebook during our trip. I bet it was awesome from up there.